school settings, and the social/psychological impact of food allergies. Reviewed by national organizations and food allergy/school health experts. This multiple choice exam can help staff test their knowledge after completing the “Food Allergies & Anaphylaxis in School: What School Staff Need to Know” module. A certificate of completion is available to be printed or emailed after passing the exam. A 6 minute video on food allergy awareness and understanding for all parents in the school community. This 4 1/2 minute awareness module is designed for elementary age children without food allergies with the purpose of increasing empathy and support and discouraging bullying. The Massachusetts experience is shared driving home the importance of practical guidelines and data collection. This piece also reflects on the ongoing challenges. 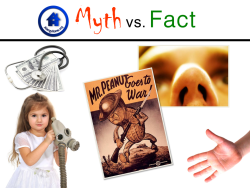 Awareness resource designed to help school nurses address food allergy and anaphylaxis myths. This reference table that highlights teaching points tailored for specific groups – elementary school students, adolescents, families with and without food allergies, and school staff. Links are provided to relevant educational materials.